Christopher Hodgkinson is one of the most important contributors to the field of educational administration. This collection of essays open up the philosophical foundations of ethical educational administration by reviewing his writings and exploring the ethical theories of major philosophers, as they apply to administration and leadership. 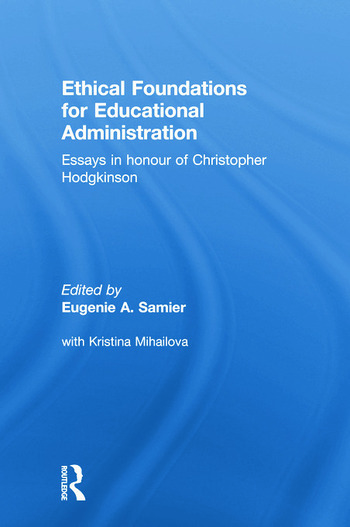 Ethical Foundations of Educational Administration is published in honour of the work of Christopher Hodgkinson. It is divided into two sections. The first comprises biographical essays and a critical evaluation of Professor Hodgkinson's work, focusing on his personal and intellectual contributions to a moral theory of educational administration and leadership. The second section looks at how his moral philosophy can inform administrative practice. The work of a broad range of philosophers is discussed, from the pre-20th century theories of Aquinas, Adam Smith and Kant to the pragmatists Peirce, James and Dewey, Heidegger, MacIntyre, Bourdieu, Churchland and Thagard. Christopher Hodgkinson's definition of administration as 'philosophy-in-action' is now famous within the field. This collection illustrates the essential truth of that maxim, showing that moral philosophy, approached in the spirit promoted by Hodgkinson has both practical and critical purpose when brought to bear upon educational administration and leadership.